Bioinformatics is known as one of the major branches of biological science dealing with the process of studying methods and strategies designed to store, retrieve and accurately analyze essential biological data including nucleic acid such as DNA and RNA, structure, pathways, functions, genetic interactions and protein sequence. It aims to acquire new knowledge which is extremely useful in vital fields including drug design and the development of newer and more feature filled software tools capable of creating knowledge. Bioinformatics also encompasses vital areas including web technologies, algorithms, information and computation theories, soft computing, artificial intelligence, databases and information systems, data mining, discrete mathematics, modeling and simulation, image processing, software engineering, circuit theory, statistics, system and control theory and structural biology. Bioinformatics can also be defined as that field wherein computer science, IT and biology are combined to form one discipline. Its major objective is to help in the process of discovering newer biological insights while creating more global perspectives capable of unifying biological principles and making all these easier to discern. It utilizes a biological database which refers to an organized and large body of data that are usually linked to computerized software primarily designed to query, update and retrieve the major data components that are already stored in the system. In order for biology experts and researches to obtain numerous benefits from bioinformatics and all the data that are stored in the biological database, the database should be first developed in a way that information can be easily accessed. If you intend to acquire more knowledge in bioinformatics and become a real expert in this field, then enrolling in the bioinformatics certification program offered by Brainmeasures is the wisest moves that you can ever take. With the bioinformatics course offered by Brainmeasures, you will have an easier time understanding even the most complex and the most difficult concepts and topics related to this branch of biological science. Considering the excellent reputation of Brainmeasures in the field of providing online certification courses, you have a hundred percent assurance that its bioinformatics certification course is also capable of providing you the highest level of information regarding the field. It allows you to take advantage of an easily understandable and highly comprehensive bioinformatics training which explains in detail the major functions of bioinformatics, the benefits of using a biological database and the most effective strategies that you can use in making the most out of this field and the developed biological database. Your bioinformatics certificate which you will receive after completing the certification course from Brainmeasures will serve as a strong indication that your knowledge and skills in this specific field are incomparable. How to start taking advantage of bioinformatics? How to become a professional in the field of sequence analysis? 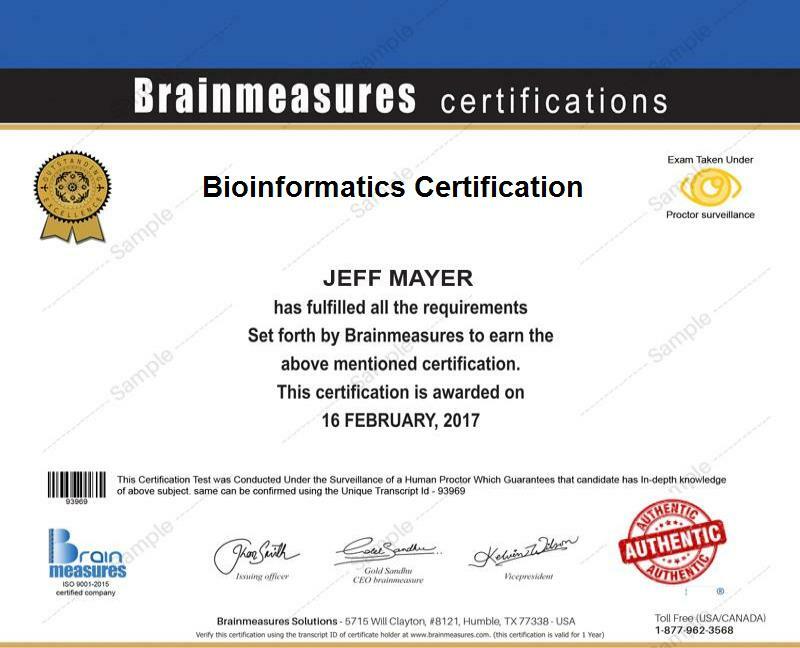 Any aspiring expert in the field of bioinformatics should consider taking part in the bioinformatics certification program offered by Brainmeasures as this covers all the topics that they would want to learn about the field. This program can offer more benefits to computer scientists, working life scientists, biology experts and researchers and any other professionals who have earned a degree in the field of computer science, biochemistry or biology who wish to enhance their careers by understanding and applying the key practices and principles associated to bioinformatics. The jobs that you can access after successfully completing a bioinformatics certification course is also a major help when it comes to further improving your financial stability. You can use your bioinformatics certification to get the position of a bioinformatics consultant which allows you to receive at least $61,000 per year. You can also work as a bioinformatics specialist which offers an annual salary of approximately $50,000 to $75,000. Working as a bioinformatics analyst is also beneficial because this profession is capable of offering you around $65,000 to $95,000 annually.